The ubiquitous “they” say that it takes visitors to make you do things that are on your own door step. 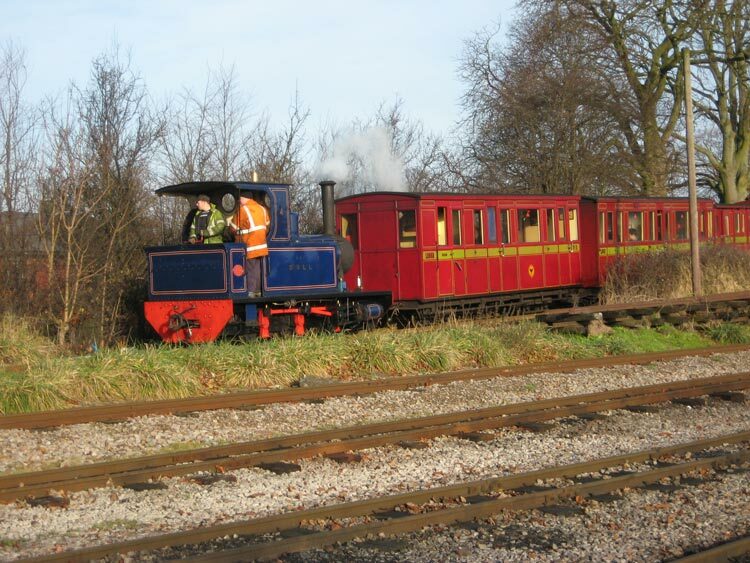 That was certainly the case when it came to the Leighton Buzzard Narrow Gauge Railway. We have been living in this town for about 24 years and, although we have seen the little trains crossing various local roads on their journeys, we had never actually visited the operation. 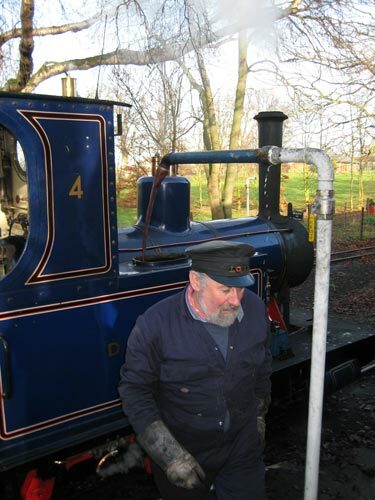 That all changed today, galvanized by Keith’s interest in all things rail. Boxing Day is one of the LBNGR’s so-called “mince pie special” days and steam would supposedly be up so off we went to the little terminus at Pages Park. The trains used to carry sand from our local sand pits to tile manufacturers nearby. Now, it is a leisure time passenger service. 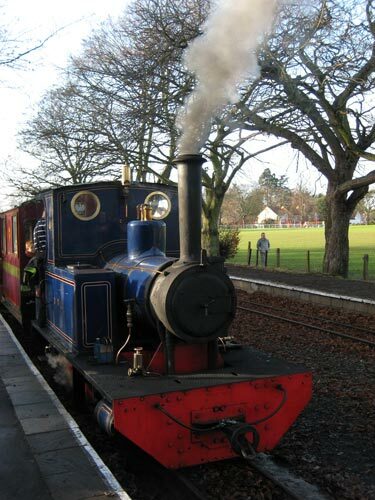 We arrived just in time to see a train disappearing round the first corner on one of its 25 minute pleasure trips so we had time to wander around the tracks and see the lines into the engine sheds before the little engine, Doll, pulled the train back in to discharge its cargo. Not too many rug rats appeared, either, which looked like being a bonus. It could be that we had lucked out and hit a lunch time lull. As the passengers disembarked, the operators began filling the engine with water, too, so we were treated to some additional interesting maintenance activity. With very little persuasion, Keith sauntered off to the office to buy a ticket (£5) for the next trip. He duly boarded the train, even braving a carriage with one or two children in it. As the train pulled out of the station, very slightly delayed while the steam changed colour having recently been stoked, Carol and I decided to drive off and try to meet the train as it made the first road crossing. Timing was perfect; as we drove across the tracks the train was just approaching the road and the attendant flag men soon appeared to stop the traffic. Carol and I pulled the car up to the give way line and played tourists by waving and grinning as the train passed. When all was clear, we shot off, threaded our way through few more back streets, and managed to find the train at the end of the outward leg of the trip. We sat and watched as the engine was being switched to the opposite end of the carriages for the return leg. We did a little more waving and grinning before returning to the terminus to meet Keith as Doll returned. We made a quick trip to the office for a few souvenirs before returning home for a refreshing cup of tea. K&M were then forced to endure a showing of Casablanca (which is, of course, the best movie ever made) before we all trotted off next door to join Paul, Liz and two of their three daughters, for a splendid Spanish meal, tapas and paella, and to make a further combined assault on the European wine lake.